That’s what today was at the sanctuary. Today, though, was a day to remind us just how beautiful it can be. Sunny, warm (for winter), and a sky so blue it was something of a shock after all the cloudy overcast weather we’ve had. There were a lot of volunteers, and a mix of people – some I see only at events or on holidays, others I see every Saturday, and others had never been to the sanctuary before. I ended up spending the entire morning picking up the pig yard, as we’ve had a lot of rain to make the pig yard messy, and I was one of the few who had boots. That is, the others who were wearing boots were either doing certain chores that couldn’t be handed off to people unfamiliar with those chores (the new people were the ones not wearing boots, as you might expect), or they were supervising the new folks. 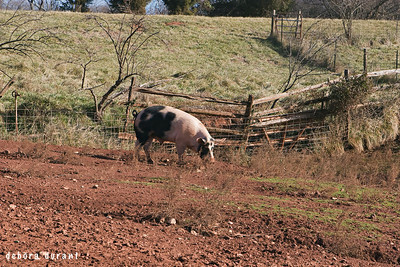 So, I was the only one available to be sent straight to the pig yard. Regardless, I don’t tend to mind the pig yard, even at its worst, so spending the entire morning in the pig yard wasn’t a bad deal to me. Terry joined me for most of it, and we had some conversation, and some quiet time. 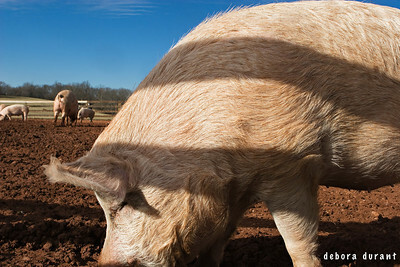 I got some great quality time with some of the pigs, who seemed to agree that it was perfect weather. 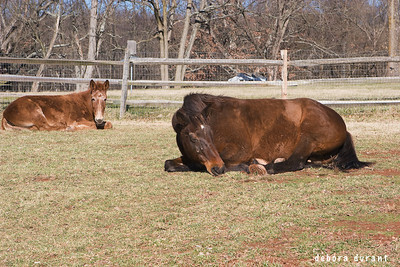 They were lounging in the sun, sleeping with their bellies exposed just in case we were of a mood to do a little belly rubbing as we made our way by. I’ve had my Poplar Spring calendar on the desk near me, so the cover picture of Petey and Otis running through the snow are fresh in my mind. They were just babies then. As Petey wandered towards me today, I couldn’t help but to marvel at how big he’d gotten compared to the picture from last year. He and Otis both, but Petey seems taller to me. They came from the same litter, rescued by the county after it was discovered that a momma pig and her piglets were living on a trash heap. 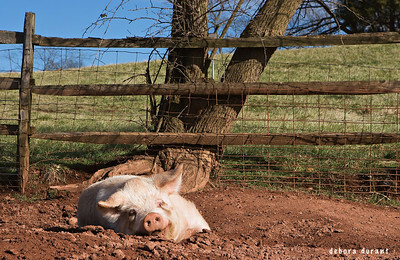 The conditions were bad enough that the farmer was actually in violation of various laws that do little to nothing to protect the pigs, and so the county put their foot down. Get those pigs to slaughter or we’ll confiscate them. Isn’t that an odd way to protect pigs? They’re being treated badly enough that the county steps in, but their orders are actually to go ahead and kill the pigs as soon as possible…or else! Or else. 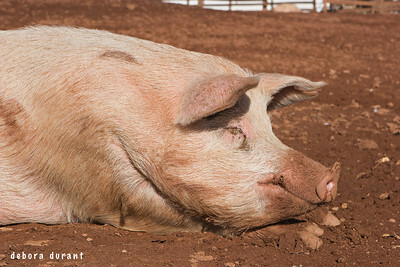 The farmer didn’t have the money to get the pigs to slaughter, so the “or else” happened. The pigs were confiscated, and two of the babies made their way to Poplar Spring once they’d had grown enough that they could leave their mom. Otis and Petey. Their “or else” was rescue. I can’t get over the irony. That was a year ago, and they’re half grown now. Petey was won over to the wonders of belly rubs very quickly, Otis has never been as open to them. Petey wandered over to me, and threw himself on the ground in front of me for a belly rub. That’s no exaggeration, either! I was afraid he’d hurt himself, throwing himself down like that! He grunted his pleasure at the belly rub. Otis wandered over eventually, grunting back to his brother, but wasn’t interested in a belly rub of his own. Peapod, two years old now, was sunbathing nearby and was grunting to the boys as well. I couldn’t neglect Peapod, so he got a belly rub too. No wonder it took all morning to do the pig yard! After all the chores were done, we fed all the animals some extra treats in celebration. “How do we know the pigs are Christian or Jewish, or what religion they are?” one of the other volunteers asked, being funny. “Their only religion is happiness,” was my reply. If you know pigs, you know what I mean! 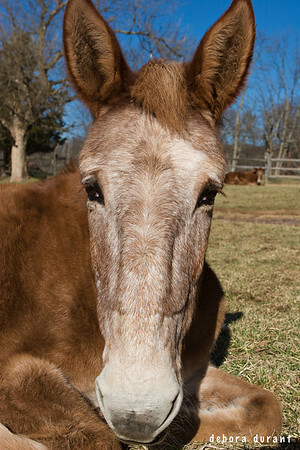 And so we fed them apples, and the horses and mules carrots. The chickens and turkeys and guineas got corn, and the goats and sheep got animal crackers. And the humans got a ton of vegan holiday cookies that Dave’s mom makes every year. Good times, gorgeous weather, happy animals, and a bellyfull of sugary goodness. There is no better way to celebrate a day off in the middle of the week, if you ask me.